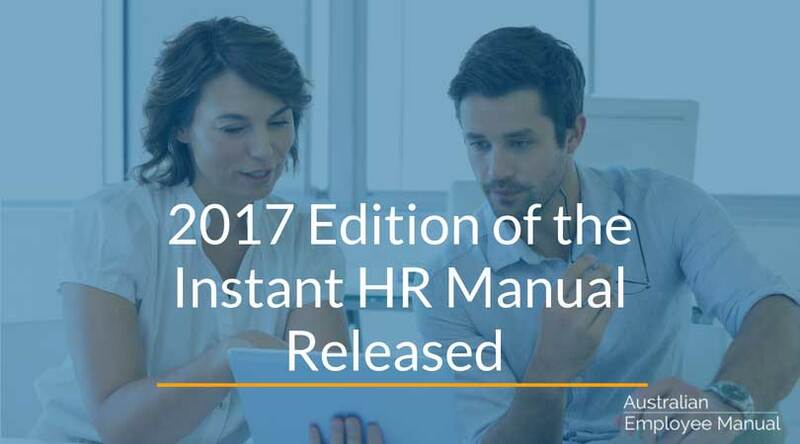 The 2017 edition of the Instant HR Policies and Procedures has just been released. Recruitment has a new section on pre-employment safety screenings for Police Certificates or Working With Children Certificates. New section on cashing out annual leave. New Mental Health in the Workplace Policy. Workplace Violence is a new policy and covers different forms of client violence and aggression. We have also merged armed hold-ups and undesirable client behaviour into this section. Anti-bribery and corruption policy is new. Insider trading has been moved to this new policy. Corporate Credit cards is a new section in Expenditure & Purchasing. New Forms: Cashing out annual leave; several new forms relating to parental leave; Gift and Entertainment Register Form. Work experience – Added in vocational placements. Work trials – Clarified when they are used. Position Description has been amended to include options for Police Certificate or Working With Children Certificate. Annual leave has been significantly updated to reflect legislative changes including maximum accumulation and notice to direct a person to take leave. Uniforms – added in religious and cultural clothing. Rearranged Chapter 4: Behaviour and Code of Conduct for more logical flow. Alcohol and drugs policy expanded. Rearranged Chapter 5: Safety & Security for more logical flow. Certificate of Service moved from Chapter 7: Admin to Chapter 2: Conditions of Employment. Fair Work Information Statement link updated. Updated Forms: Direction to take excess leave; Induction Checklist, Reference Check; Leave application. Orientation Manual now includes a provision that the manual may be subject to change. A stack of grammar, spelling and formatting tweaks to simplify the document even further. The HR Manual is just $217 Incl. GST for pre-prepared templates, forms, employee policies, procedures and guidelines.